At first glance, the photograph at the top of this post looks like it might have been taken at a US military encampment somewhere on the far side of the world. There are neat rows of uninsulated tar paper covered temporary barracks, facing onto a central, dust-swirled bare dirt parade ground, an American flag flying prominently, all in the shadow of high, almost indescribably beautiful mountains. A closer look, however, shows a very human, very non-military detail: children running through an otherwise static scene. 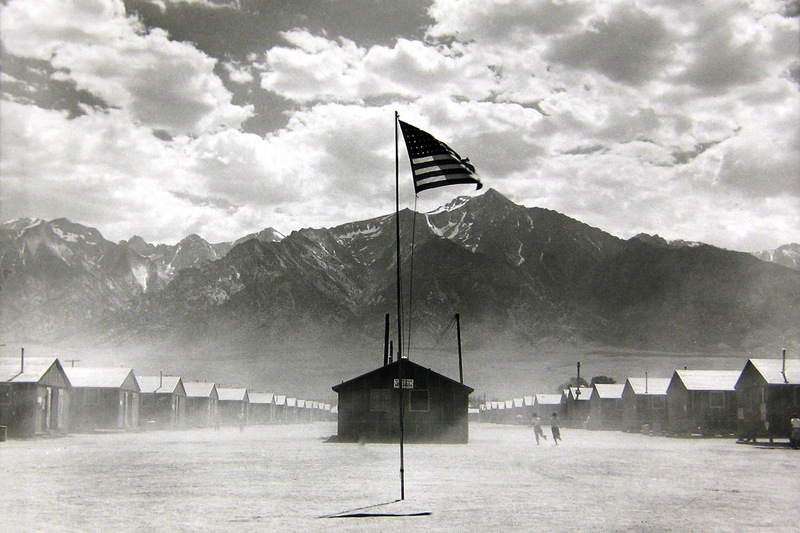 In reality, this picture was taken at a United States concentration camp. 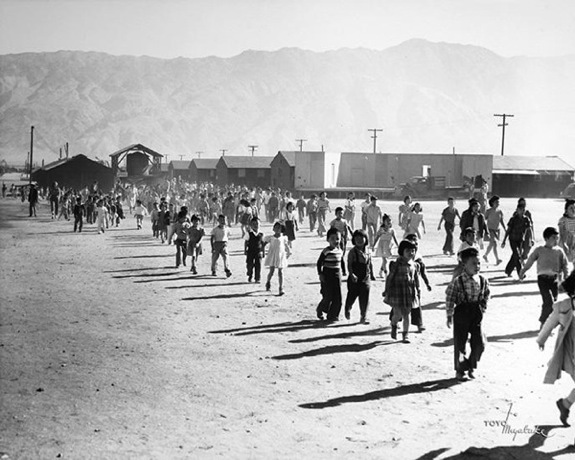 In 1942, over 110,000 men, women and children of Japanese descent, the vast majority of whom were US citizens, were rounded up at gunpoint, their homes and property seized and forfeited, and transported, along with only those few possessions that each could carry in their hands, to various camps such as this one at Manzanar, located in the high desert of California's Owens Valley. Herded into crudely built, inadequately heated shacks with questionable communal sanitation, and forced to work in plantations surrounding the compound, none of them knew how long they would be held, or if they would ever be free again. 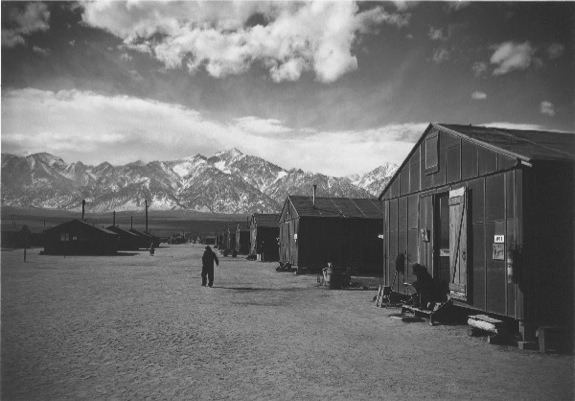 One detail seldom mentioned today are the eight guard towers that were placed around the perimeter of the facility, each with multiple, permanently mounted large caliber machine guns capable of a high rate of fire, manned 24 hours a day, pointing directly into the residential area. In a testimony to the resilience of the human spirit, the detainees were able to maintain their dignity under almost intolerable conditions. 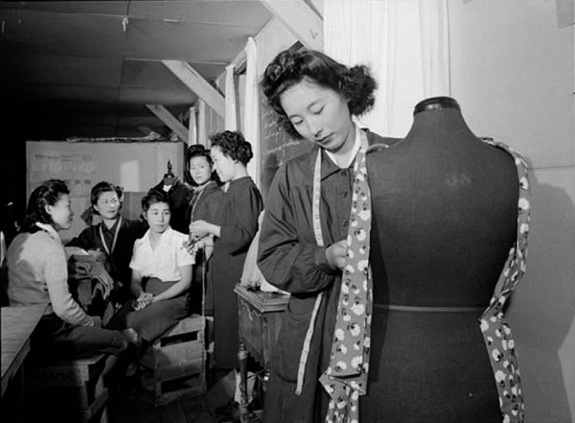 A patchwork social structure was soon established out of a population that up until then were mostly strangers to each other; what they all had in common, besides sharing a heritage, and the reality of their detention, was a basic sense of honor and courage in the face of adversity, passed down through Japanese families over centuries. 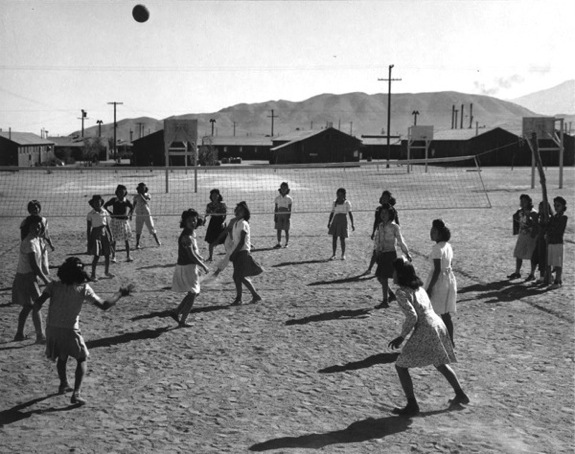 Schools were established; sports, music instruction, art classes and other recreational activities encouraged, and those with prior medical education and training cared for the ailing and infirm. And throughout the years of their imprisonment, they never let go of the hope that some day, they would be released from their long exile. 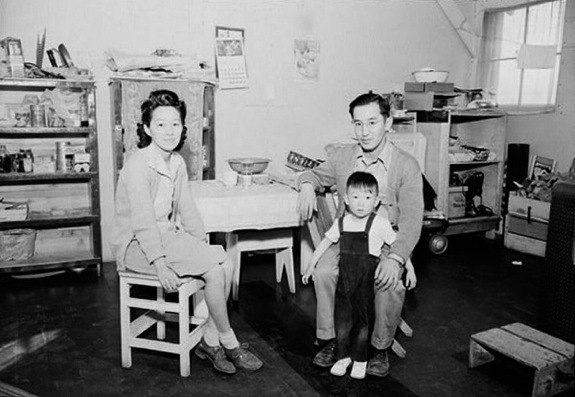 After the end of World War II in 1945, these Japanese prisoner of war families were allowed to return "home" to rebuild their lives, although the houses they once owned were no longer theirs, their businesses and financial assets seized, their jobs long gone. It is a supreme irony that, even while our nation was fighting, in the noblest of causes, against the oppression of Fascist powers overseas, we engaged in a certain amount of tyranny ourselves. 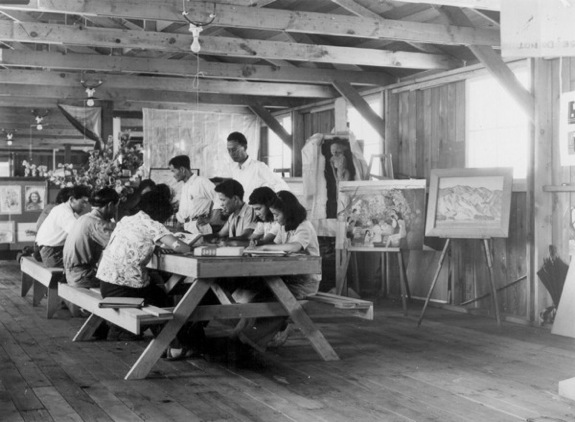 These events aren't taught in U.S. history classes, but luckily, this one small part of the American experience has been well documented, and anyone wishing to really dig into the history of the so-called "war relocation camps" can do so easily. 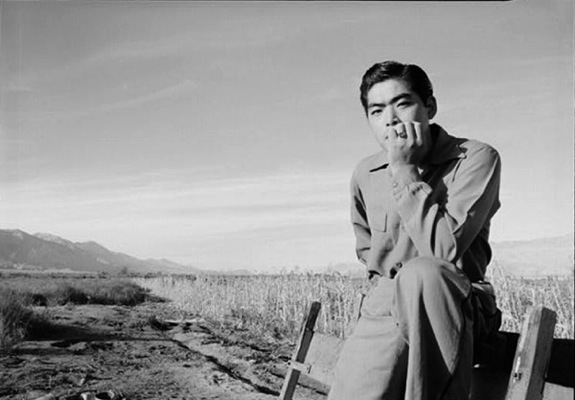 Also fortunately, there are numerous photos taken at the camps, by such well known photographers as Dorothea Lange and Ansel Adams, as well as by some of the internees themselves, like Toyo Miyatake. 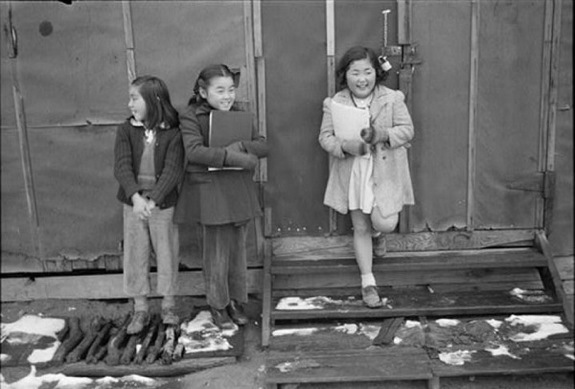 Although I'm not old enough to have been a witness to that time and place, I did meet many others of Japanese descent who were. 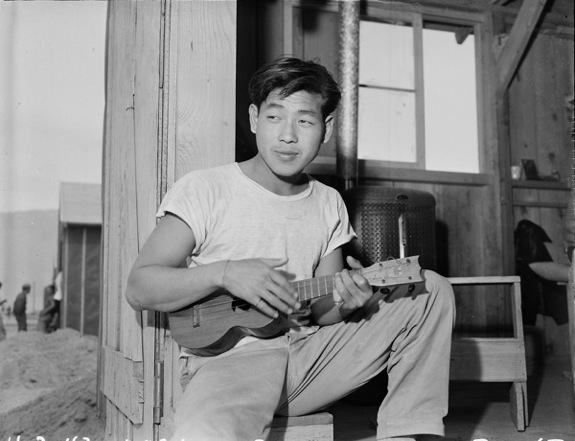 My family moved to the US from Japan not very long after the camps were closed, and settled in a town that had a sizable Japanese community. The interesting thing is, that even though I grew up among, and had daily interaction with families whose older members had themselves been incarcerated, I was totally unaware until much later in life that anything so momentous had ever happened: they simply never talked about it. The Japanese families of my youth lived in neat, well kept houses, unsegregated, alongside everyone else in what was then a dynamic, multi-ethnic working class town, among first and second generation Italian, Yugoslav, Polish, Hungarian, and Jewish families, as well as long time US residents, and other immigrants from all over the world. Many of the new arrivals had their own stories to tell, as refugees who fled the horrors of war torn Fascist Europe, but they didn't dwell on it; instead, they were all busy becoming, or getting back to being, fully American. 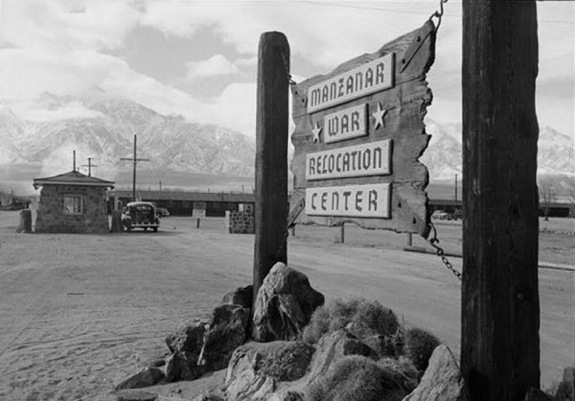 The story of Manzanar and the incarceration of an entire nationality of people is just an example of an essentially good and decent society collectively having a really bad idea, fostered in a climate of xenophobia and fear, and turning that bad idea into reality. It's nice to think that we can learn the lessons of history, and that nothing like this could ever happen again, but - we might just be wrong about that. When the eventual nominee of one of our major political parties came down a gold plated escalator and announced his intention to run for the office of the Presidency of the United States, he immediately made clear what was to be the focal point of his candidacy. From the beginning, and throughout the long campaign season, the former television "reality" show star has demonized those of Mexican descent as thieves, rapists and murderers, and threatened a crackdown on followers of Islam. For the first time in the history of our country, a presidential campaign has been explicitly based upon bigotry, religious intolerance and openly voiced racism. Nothing underscores this point better than the fact that every Neo-Nazi and white supremacist group, including the Ku Klux Klan, has endorsed the Republican candidate. Deliberately using fear as a rhetorical device, and stoking resentment and hatred among his followers, a disproportionate majority of whom are white males, the Republican party nominee has called for the rounding up of millions of immigrant families of Hispanic descent, repeatedly denigrated members of other nationalities, encouraged violence at his political rallies, and suggested the assassination of the opposing party's candidate. He has portrayed the press as corrupt, mocked the disabled, demeaned the service of veterans and aid workers, and regularly directs derogatory language and fat-shaming towards women. Endangering both our economic stability and national security, he advocates cancelling international trade agreements, backs the dismantling of long standing multi-nation treaties and non-aggression pacts, and has considered the use of nuclear weapons in Europe and the Middle East. As extreme as this candidacy may appear, the Republican party's leadership has nevertheless given their blessing and full backing to the nominee, effectively endorsing his policies and positions. Since that party currently controls the other branches of government, there is the very real possibility that the outcome of this year's presidential election will not only determine the short term political landscape, but also alter the very fabric of our nation's society, in ways we may not be able to imagine. 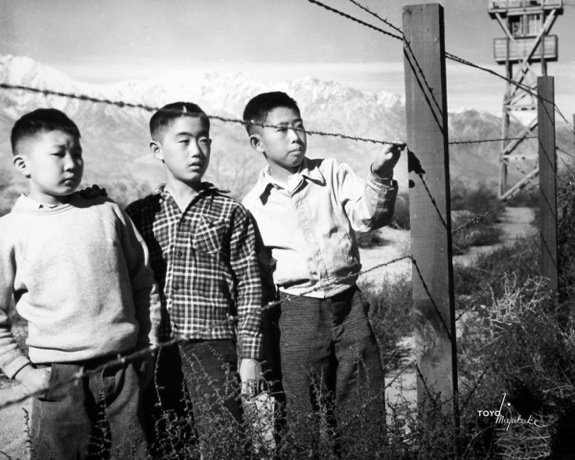 A final note (thanks to Charles Pierce for the info): Korematsu v. United States, the legal case argued before the Supreme Court in 1944, which by a vote of 6-3 upheld the government's right to mass incarcerate U.S. citizens of a given ethnicity or nationality, has to this day never been overturned. 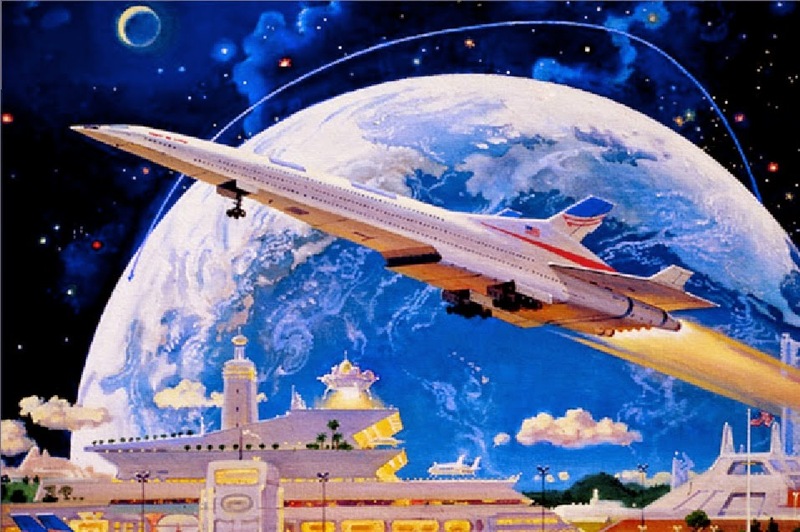 This essay is also posted at my new commentary blog, Blue Mountain Winter. 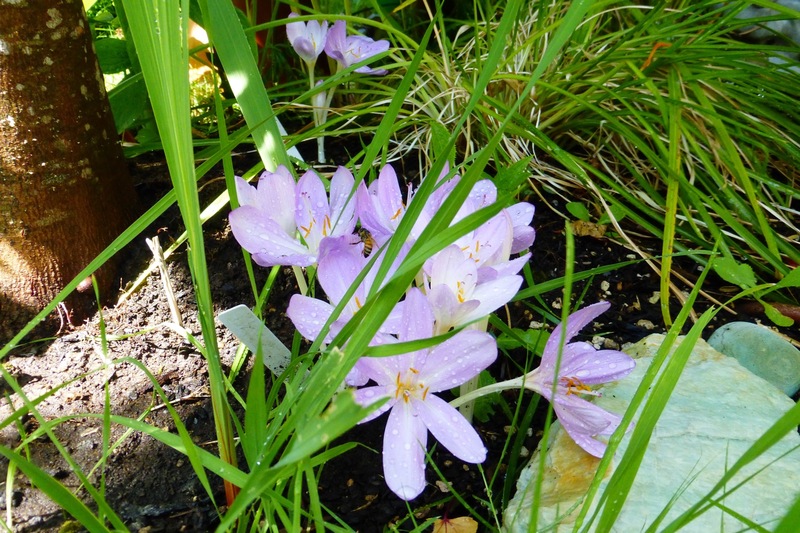 Poking around the back yard early this morning, I realized I hadn't noticed that some late summer crocus had popped up, as is their habit - not here one day, but suddenly, here they are. Then again, I've been gone for a few days. 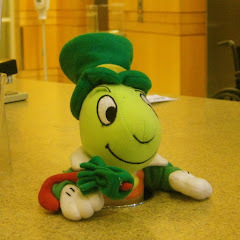 We never know how many we'll see in any given year; they don't seem to spread much, but that may be due to our crummy volcanic clay soil, which we don't amend much. Lazy gardeners. Took a picture, just to capture those lovely shining dew drops on the blooms. When I was reviewing the shot, I noticed a honey bee atop one of the petals. It was early enough that the sun had barely hit this part of the garden, and it was still cool under the shade of the young maple. So, like me, the bee was just getting started, moving slowly. 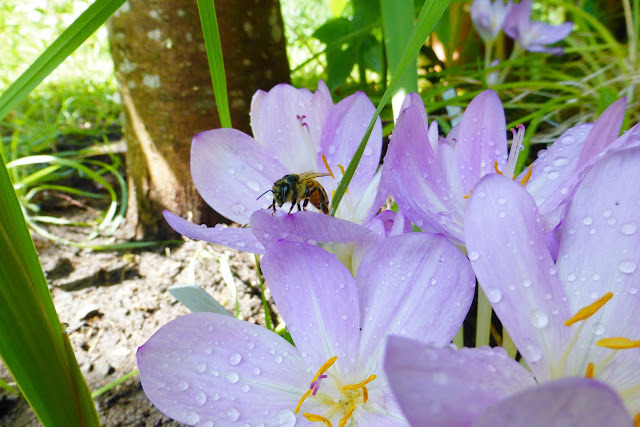 Put the camera in macro mode, moved up closer to the crocus, and snapped another shot. I don't know why I like honey bee faces so much - they're just another flying bug, but something about them appeals to me. Fly faces seen up close, on the other hand, are terrifying; maybe I've seen too many horror movies. Bees (but not wasps or hornets), in comparison, seem almost friendly. Bee-nign, maybe.